We’re coming to Dubai on Saturday November 11th and we can’t wait to get colorful with you! Grab your bezzies or crew of kids and family and sign up today! Get your tickets now from just AED 160! 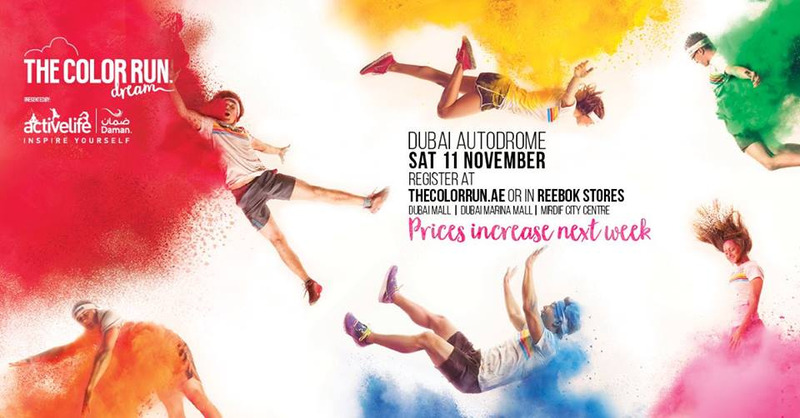 Register at thecolorrun.ae or in Reebok stores at Dubai Mall, Dubai Marina Mall, Mirdif City Centre and Yas Mall in Abu Dhabi. Get ready to Dream in Colors. The Color Run™ presented by Daman’s Activelife takes Color Runners to a world where anything is possible and inspires participants to make dreams a reality in this magical 5K course as the Dream World Tour comes to Dubai! Color Runners will feel on top of the world in the brand‐new Foam Zone, enjoy all new color zones, more color zones than ever before, and asalways...will be covered from head to toe in color! Along the course, participants can show their aspirations on the Dream Wall, snap photos with giant unicorns, and enjoy the ultimate color party with family and friends at the Finish Festival…with color throws! Each Color Runner will receive a limited‐edition Dream Tour race shirt, embroidered headband, a fun temporary tattoo, welcome card and rainbow pencil. Deluxe Runners will receive all of this plus VIP Parking, a wristband, tutu, party socks and sunglasses to rock on the day! Bring your BFF's for the party, it’s a 5K course that will have everyone feeling like they’re on Cloud Nine. Don’t miss your only chance in the UAE to be part of the Happiest 5k on the Planet! Gates will open at 7am on Saturday 11th November, and our first Color Runners setting off at 8.30am!